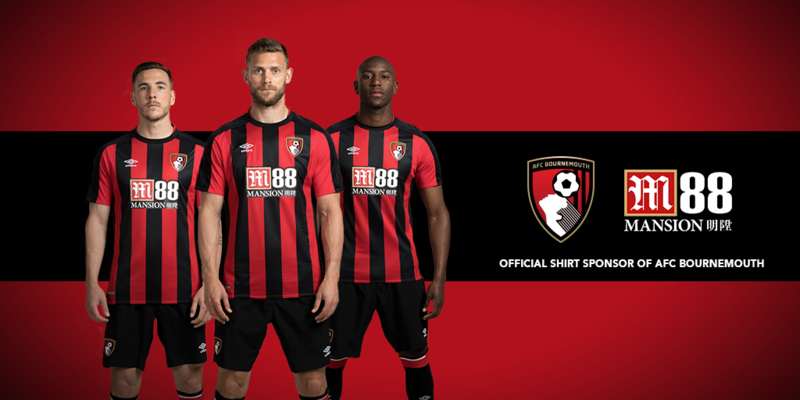 June 22 – Premier League Bournemouth have signed a record sponsorship deal with online gaming company Mansion, continuing the relationship with the firm whose M88 logo will appear on the front of the Cherries’ home, away and third shirts. The two-year deal sees M88 supplant the Mansion.com brand, which featured on the shirt for for the previous two seasons. M88 will also have pitchside branding at the Vitality Stadium during live broadcasts of the club’s Premier League matches. No value was put on the deal which was negotiated by sports marketing agency SportQuake. M88 will create exclusive content for the club’s fans and run fan promotions and live events. A focus of the marketing activity will be around increasing Bournemouth’s profile in Asia and opening the club to Asian fans. Bournemouth’s new kit, supplied by Umbro, goes on sale to fans on July 1. Umbro were unveiled as the club’s new technical kit supplier in what was also a club record deal in April. The new partnership begins with the 2017/18 season and will run for five years. Umbro replaced JD Sports.